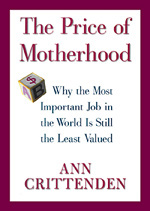 After reading The Price of Motherhood, Why the most important job in the world is still the least valued by Ann Crittenden, I realized that the place I call Mommyville is real. The location where I feel tremendous love for and by my child, but where I am completely invisible to the outside world is in fact created by the culture I live in. In chapters like “How Mothers’ Work Was ‘Disappeared’: The Invention of the Unproductive Housewife,” Crittenden discusses things mothers know intuitively, but don’t want to talk about, can’t quite put their finger on or sadly, think is just a personal issue, like getting a divorce with children is a sentence of poverty. Or that moms are directly impacting GDP (Gross Domestic Product) and yet in the United States the contribution of raising children is not calculated into the formula for the creation of our economic health. Throughout the book, Crittenden uncovers the history, politics and phenomenon of how mothers’ work is unvalued in our culture. Now lest one think I just picked this book because I am feeling crabby, let me say that this book has so turned my head around and spotlighted what I have been feeling from the moment my daughter was born, which was that I had somehow become irrelevant. This was acutely more distressing since I came to the marriage and baby-making party quite late. Being a single career woman till after 40 means that the shock has been tremendous. But, after reading this book, I don’t feel crazy anymore. Crittenden discusses money, how it’s spent, and who has control of it in the context of marriage, being a stay-at-home mom and raising children. What’s eerily fascinating is that those fights I sometimes have with my husband are actually the same fights many women are having...because really husbands’ attitudes are shaped by the larger culture as well. I am reviewing this book—which is not new, it was originally published in 2001, though it did get new preface from the author in 2010—because I want to contribute to the mommy revolution...we are in one right now. I want to remind us that it is mothers who make the big changes for the good in this world. Consider the film The Race To Nowhere, which is challenging America’s push for excessive achievement in school or a more recent film, Miss Representation, that considers the limiting images of women in the media. What’s so wonderful about these films is that the writer/directors are mothers, who embrace their motherhood role to champion change. Put their work together with The Price of Motherhood and one finds a potent mix of information and empowerment. Read The Price of Motherhood and discover why “feminism” or even conservatism have an investment in keeping the work of mothers invisible. Read The Price of Motherhood and discover why wealthy women have a tough road in marriage and divorce. The truth is that divide and conquer has always kept women from finding their voices. See what Crittenden reveals about the most important work on the planet: raising kids. It will give you a whole new prospective about the phenomenon of being a mother in the 21st century. P.S. Definitely check out Crittenden's website, linked above. In Contacts there is great information about improving the economic status of mothers.